Windies captain Jason Holder currently holds the second best Test bowling average in a calendar year for the last 100 years, having taken 33 wickets at an average of 12.39 in 2018. Holder has enjoyed a great year with the ball, taking four five-fors (and one 10-wicket haul) in six Tests, including four of India’s top seven in the first innings of the second Test at Hyderabad, where India vanquished the West Indies by 10 wickets. 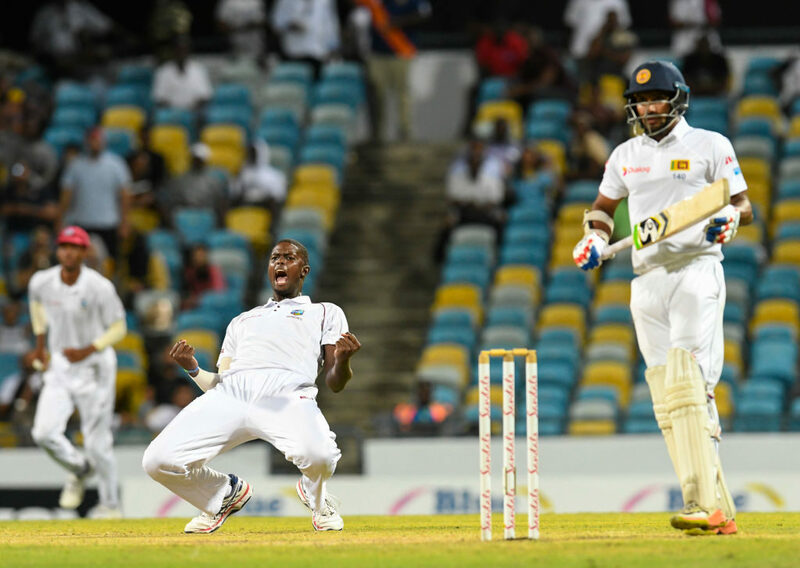 The West Indies have only played three Test series this year, starting against Sri Lanka in June, when they dominated the series but ended drawing 1-1. They then dominated Bangladesh, winning both Tests in the series, before suffering a resounding 2-0 defeat at the hands of India. Holder has taken the fifth-most Test wickets this year behind South Africa’s Kagiso Rabada on 46 wickets from nine Tests, England’s Jimmy Anderson (42 in 10) and Stuart Broad (35 in 10), and South Africa’s Keshav Maharaj (34 in eight). Holder’s performance is especially impressive because he has played far fewer Tests than the bowlers above him in the wickets list, as well as the fact that his average (12.39) is almost half that of his peers, and his economy rate (2.72) is second only to Anderson (2.46). One of the key stats for a fast bowler is strike rate, and Holder has taken his 33 wickets this year at a staggering rate of a wicket every 27.3 balls. 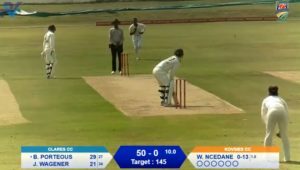 While some might highlight the fact that he has taken the bulk of these wickets against Sri Lanka and Bangladesh, in the one Test he played against India he took 5-56 in the first innings at a strike rate of a wicket every 27.6 balls, which is comparable to his performance against the other teams. Arguably, had Holder played in the first Test against India, he might well have changed the course of the series. ESPNCricinfo put out a meme celebrating Holder’s achievement, although they made a miscalculation and put him at the top of the list whereas, in fact, he is in second place, fractionally behind Pakistan’s Shoaib Akhtar. 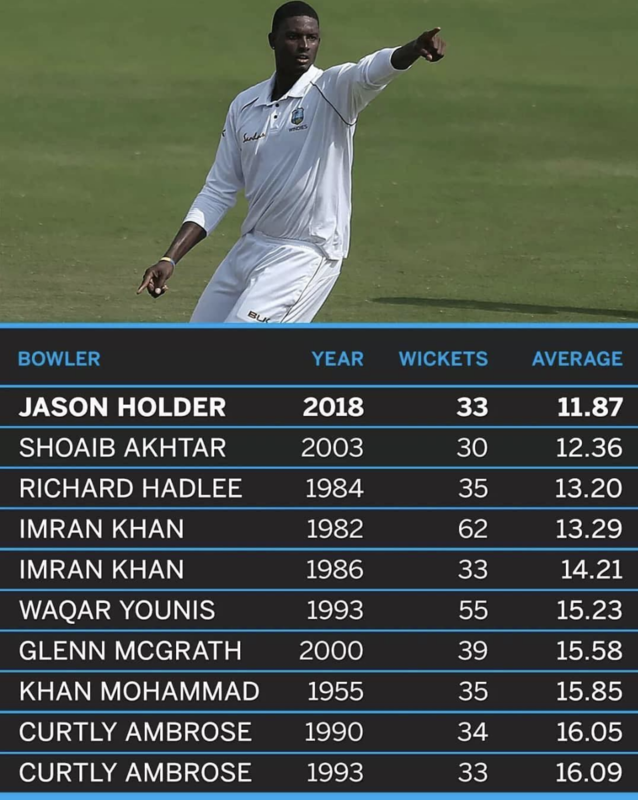 Based on Holder’s current form, there is every chance he will pip Akhtar to the post come the end of the year, but thanks to ESPNCricinfo spotting his low 2018 average (and its relevance in cricketing history) the world has been made aware of his incredible performances this year. Holder has also scored 336 Test runs (ave 37.33) with two half-centuries this year, but he was critical of the West Indies top order after failing three times with the bat in their four innings during the 2-0 series loss to India. ‘In my short tenure as a Test cricketer [I’ve learnt that] you’ve got to be patient and build on what performance you intend to put on,’ said Holder after the India series. ‘You can look and honestly say we didn’t put enough runs on the board. Quite for some time now we’ve been relatively inconsistent and that has really let us down in the recent past. We haven’t been getting the runs we’ve been looking for. The West Indies have two more Tests to look forward to in 2018, both away to Bangladesh in November.